Looking back, its amazing that one of the most popular programs in the history of the legendary CBS-FM was cancelled in 2002. But, considering the plans being formulated in the formerly smoke filled upper rooms of CBS Corporate brass for the future of WCBS-FM, its understandable. The first incarnation of Saturday night Oldies with Do-Wop music occurred in 1969 on WCBS-FM. It was shortly moved to WPIX-FM as WCBS-FM was in the middle of it’s “Young Sound” format. The show would return to 101.1 FM in 1975 and would remain as a staple of WCBS-FM programming until its abrupt cancellation in 2002. The program host who held that position the longest was Don K. Reed. The Do-Wop Shop was a one of a kind program, with it’s own, Do-Wop style WCBS jingles, even special jingles sung for the show and Don K. Reed. It was a show featuring original 1950s Do-Wop style hits, Do-Wop artists and plenty of songs that may not have ever seen airplay but that fit the shows format. Even in the 1990s, during the time that this aircheck was recorded, Reed would utilize a turntable to play many of the rarities heard on this show. Even during this era it was very rare to hear record crackles and scratches but that was part of what was the legend that was the Do-Wop shop. Frequently, there were guest musicians in the studios, lengthy interviews and the occasional letter read on the air. And then, there were the callers, whom Reed would warmly receive on air to play their requests or even listen to a story relating to some Do-Wop act or club. This was a one of a kind program that simply can’t be recreated. This starts with Bobby Jay with the bottom 3 songs of the Top 20 Albums for the week of February 5th, 1965, then moves right into The Do-Wop Shop with Don K. Reed – it’s an OUTSTANDING recording of historic significance! I love the old air checks. Koool! Actually, the first oldies show on WCBS-FM started on Sunday night in 1969. Gus Gossert was the DJ then. He was the first to play the rare doo-wop records that the other stations didn’t play. Gossert moved his show to WPIX-FM in 1971 (and expanded it to Saturday night as well). He left WPIX the following year. After that, Norm N. Nite started a similar show on Sunday on WCBS-FM, which he called the “Nite Train” show. (Having grown up in Cleveland, Norm was very familiar with the early doo-wop records that Alan Freed had played on WJW.) 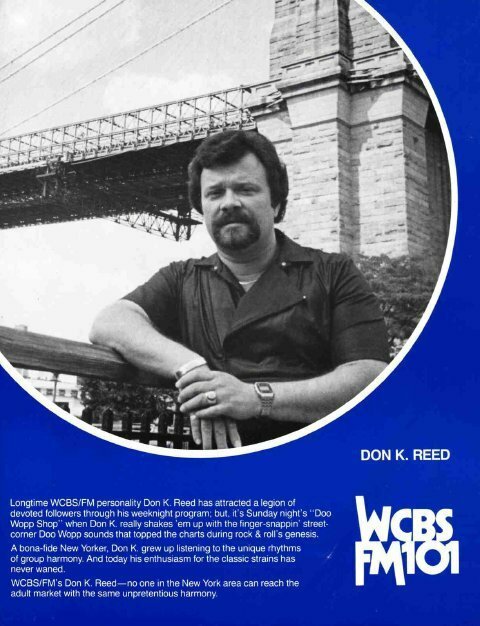 When Norm moved over to WNBC in ’75, Don K. Reed took over the show, and it was renamed “The Doo-Wop Shop”. In the late 80’s I was living in Hoboken, and learned that I was being transferred to Tampa, Fl. I had a feeling that Tampa would not have a radio station the likes of WCBS-fm so for the 9 months before my transfer I taped Friday Nite 50s, Sunday nite countdown & of course The Doo Wop Shop Sunday. I’ve since transferred some of the cassettes to cd..so even tho the olde WCBS-fm is no longer available even in NYC, I still have it with me all the time. Yeah, man! Don K. Reed! Do you have some of those shows? We’d LOVE to get hold of ’em! You can reach me at [email protected], or call me at (413) 358-1971. I also have been trying to locate a site for Don. He used to be a customer of mine and I would love to know what he is up to these days. Carol: I have seen Don and his wife recently on Long Island. They are both fine. I, too, miss hearing his mellow voice on CBS-FM and never missed the Doo Wop Shop. He is a true gentleman and and literally an encyclopedia of music. is there a website to hear the old songs just like it was on wcbs fm? Don K. Reed has his famous Doo Wop Shop on The Belmonts’ Internet Radio Sunday nights at 7PM. with such memories. Then Don K Reed came on stage and introduced another group and left the stage. We wish he would have stayed a bit longer. He was the best and we miss him. We plan on listening to him while we drive down to Florida next week. There used to be a radio show broadcast from Fordham University in the Bronx. They played obscure early 50″s do wop. Does any one remember the name and are there CD’s to be purchased from the show. every sat night at 12mid tune in to group harmony review on wfuv-fm. you can also listen to wfuv streaming. With his own show just go to the Belmonts .com it should come up internet radio.